Blizzard warnings stretch from Virginia to New York as the snow storm most of the country has been watching all week begins to bear down in the East. This system began dropping heavy amounts of snow from Arkansas and Mississippi to Pennsylvania and New Jersey on Friday. From there, the snow continues along the East Coast up to Massachusetts. 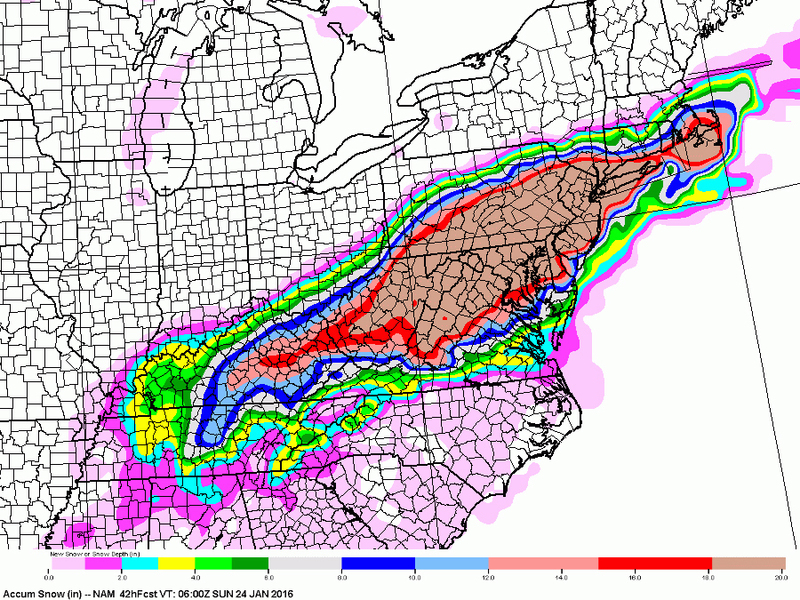 The heaviest snow is expected across northern Virginia and Maryland. Some spots could get more than two feet of snow, and most of Maryland and northern Virginia are expecting between one to two feet. This is a strong storm with the potential for some strong winds in addition to the heavy snow, which could cause blizzard conditions. The Northeast will see the last of this storm on late Saturday, when it finally moves into the Atlantic. In the meantime, expect a lot of snow — and for some in the Mid-Atlantic and Mid-South states, a wintry mix that's sure to make things extra slippery heading into the weekend.